The photo prompt this month for The Bloom Collective is low light. I have to admit that I do struggle with low light. My camera is usually tucked away nicely after the sun goes down and I typically don't bother to "document" our evenings. That sounds SO horrible to say because SO much of our life happens after the sun goes down and before it comes up. Sometimes ambient lighting is the only thing you've got + I promised to cut myself some slack this year with my Project 365. I'm embracing and loving low light these days and I'm so grateful for the team at The Bloom Forum for continuing to push me creatively! I took this image right before we kids were going to bed. It was pitch black outside and the only light on in the room was the lamp on their coloring table. It was just the coziest little set up and I knew I wanted to capture them together like this. 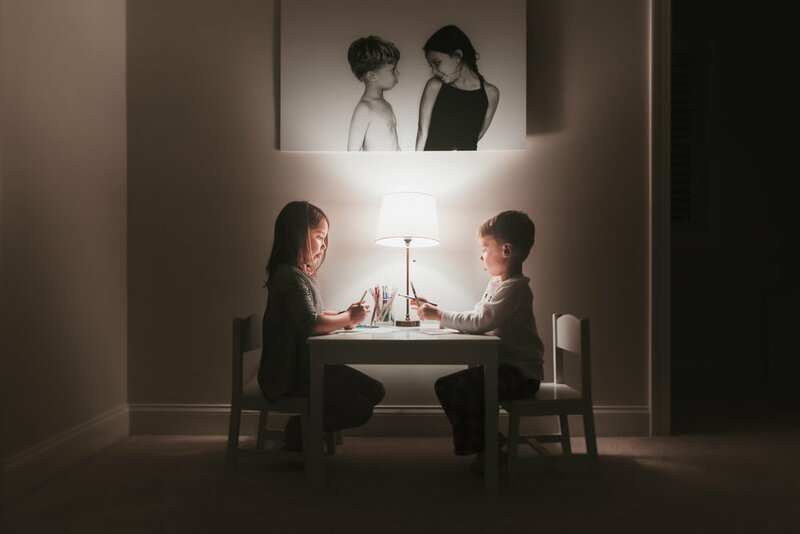 You can stop by the Camera Mama blog to see my tips for photographing with ambient lighting. And be sure to check out The Bloom Collective to see more from this month's prompt - low light.